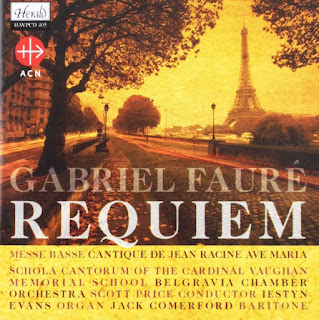 This disc from Herald, recorded in 2015, gives us the original chamber version of Faure's Requiem recorded by the all-male Schola Cantorum of the Cardinal Vaughan Memorial School and the Belgravia Chamber Orchestra, conductor Scott Price, with Jack Comerford (baritone), Karol Jozwik (treble) and Iestyn Evans (organ). There is more Faure for the companion pieces, the Messe Basse (with treble soloist Alessandro Mackinnon), Cantique Racine and Ave Maria. The performance rather surprises at first, because Scott Price's speed is so remarkably slow for the opening section. It works, just, but I was quite relieved when the faster section started to move at a more familiar speed. From then on, Price takes a fairly conventional yet relaxed view of the work, letting it gently unfold and letting the special qualities of his performers shine. The choir is the liturgical choir of the school and numbers over 50 including 28 trebles, but it is worth bearing in mind that these are young voices so the sound is quite light and transparent. When the faster section of the 'Introit' starts, we can hear the lovely youthful flexibility in the tenor line, and there are many places on this disc where the quality of the lower parts impressed me greatly. The result has a simplicity and directness which is very appealing, so the opening of the 'Offertoire' is beautifully moving because the singers do not try to do too much with it. Faure's version of the Missa pro defunctis lacks the fire and brimstone of some settings, and this very much suits these forces. The recording is made relatively close to, so there are moments when we experience the orchestral accompaniment (five violas, five cellos, two double basses, two horns, harp and organ) as a chamber group with awareness of individual lines. And the same is true of some of the choral passages, where we can feel the individuals. The reduced orchestra brings out the intimacy of the work, and I loved some of the instrumental moments with lovely mellow sounds from the violas, and some magical instrumental combinations. Philippe Honore provides the fine violin solo in the 'Sanctus' and 'In paradisum', whilst Karol Jozwik gives us a lovely clear account the 'Pie Jesu' and Jack Comerford, a former pupil at the school, is the mellow baritone soloist. The first companion work, Cantique Jean Racine is one of the highlights of the disc, and seems to fit the performers admirably. The Messe Basse perhaps slighly less so, as this work for trebles and organ needs to sound effortless and flowing whereas were are sometimes aware that the young singers here are challenged, though the overall result has a nice freshness to it. We finish with the Ave Maria, not Faure's finest piece but one sung admirably by the young men of the choir. This is not a library choice, though it will certainly delight the choir's many supporters and for the casual listener there is much to delight also. Recorded 15&16 November 2015 at St Jude's Church, Hampstead.